The 52-million-year-old fossil of Eofringillirostrum boudreauxi. A 52-million-year-old fossil found in Wyoming is now the earliest known seed-eating perching bird in the scientific record, a discovery that’s shedding new light on the history and early eating habits of these now-ubiquitous birds. Perching birds like crows, finches, sparrows, and robins are prolific, accounting for more than half of all bird species alive today. Also known as passerines, these birds are distinguished by the arrangement of their toes, in which three point forward and one points back—an orientation that, as the name suggests, is amenable to perching. Despite their current diversity, however, passerine fossils are scarce, hindering scientists’ understanding of how and when they evolved. The recent discovery of two ancient passerine fossils, one in Wyoming and one in Germany, represents an important contribution in this area. Fossil Lake is renowned for both the diversity of its fossils and their quality. The Wyoming specimen is no exception, preserving fine details of this ancient creature in crisp relief. Ksepka and his colleagues named the new species Eofringillirostrum boudreauxi (pronounced ee-oh-frindz-oh-rah-strum bo-dree-oh-shee), the first part meaning “dawn finch beak” and the latter part in honor of long-time Field Museum supporters Terry and Gail Boudreaux. Eofringillirostrum is now the earliest fossil showing a bird with a finch-like beak, resembling those found in modern sparrows and finches. Older passerines have been discovered before, including 55-million-year-old fossils found in Australia, but those earlier versions weren’t capable of eating seeds, munching instead of fish and insects. Eofringillirostrum were about the size of a red-breasted nuthatch—a fairly common species spotted at bird feeders in the U.S. Northeast. Eofringillirostrum lived in a subtropical environment, surrounded by small primitive horses, early bats, and boa-like snakes. Back then, Fossil Lake was filled with herring-like fish, gars, and even freshwater stingrays. 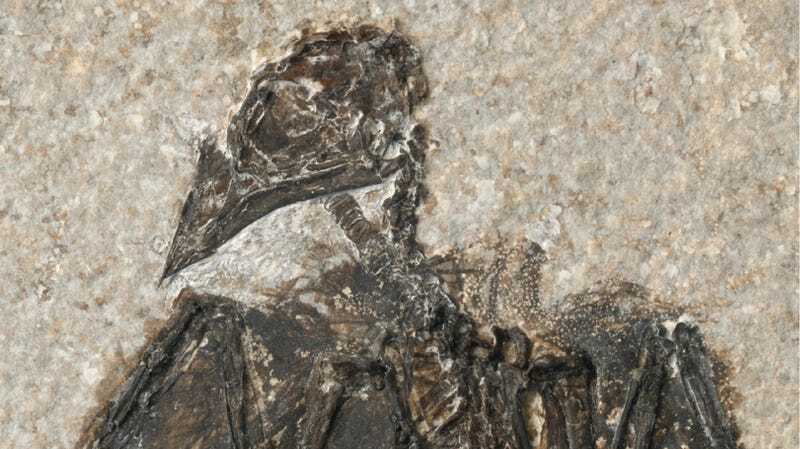 The German specimen, another Eofringillirostrum, lived far away, showing these birds had spread out geographically around 47 million years ago. That said, the paucity of fossils suggests they were relatively few in number. The new research also suggests that the avian ability to eat hard seeds is a relatively recent evolutionary phenomenon. Importantly however, while early passerines evolved many different beak shapes, none of these species left any descendants that survived to the present day. At any rate, we know that a diversity of beak types were in place by the time of the Early Eocene, including the finch-like beaks of very early passerines. As always, the discovery of more fossils will shed even more light on this important period of avian evolution.